I love those frozen pot stickers you find at the whole sale food stores. I snack on those things like I'm getting paid to. I always wondered how hard could it be to make them myself. So I gave it a shot. Mix all ingredients except wonton skins, broth and soy sauce. Brush each wonton skin with water. Place slightly less than 1 tablespoon chicken mixture on center of skin. Pinch 5 pleats along edge of half of circle. Fold circle in half over chicken mixture, pressing pleated edge to unpleated edge. Repeat with remaining skins and chicken mixture. Spray 12-inch skillet with cooking spray; heat over medium heat. Cook 12 pot stickers at a time in skillet about 3 minutes or until light brown; turn. Add 1/2 cup of the broth and 1 teaspoon of the soy sauce. Cover and cook 5 minutes. Uncover and cook about 1 minute longer or until liquid had evaporated. Repeat with remaining pot stickers, broth and soy sauce. In a small bowl combine soy sauce, brown sugar, garlic, ginger and black pepper. Set aside. Remove Yaki Soba from packages and discard included flavoring packets. Rinse noodles well, drain, and set aside. Heat oil in a large wok or skillet. Add celery and onion and saute for about 1-2 minutes or until onions start to become soft and transparent. Add cabbage and saute an additional minute or so. 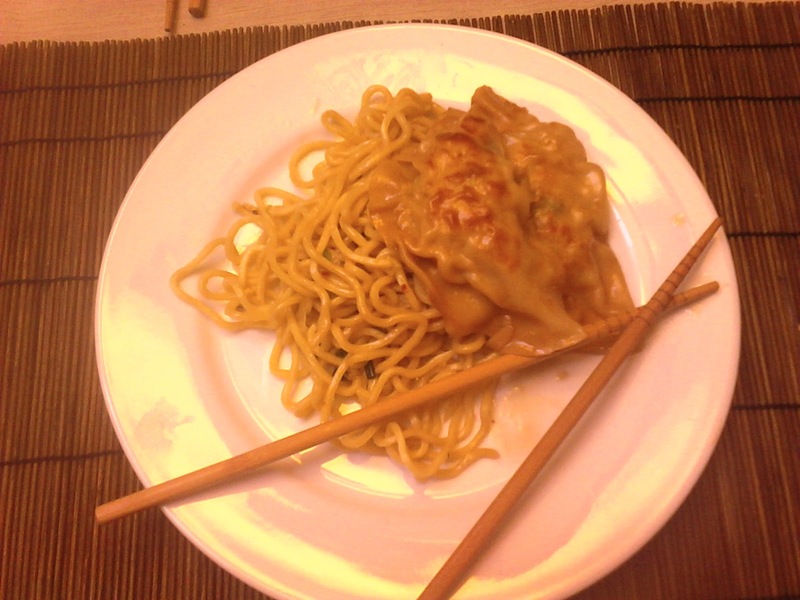 It was so easy to make both the pot stickers and the chow mien. I am going to have to try both again with some changes. First, although I found the pot stickers tasty, I found them soggy as well. Either I did something wrong or I need a different recipe to suit my taste. Also in the chow mien I used Napa cabbage. It worked great in the pot stickers but just didn't taste well in the chow mien. I might try using bok choy next time.